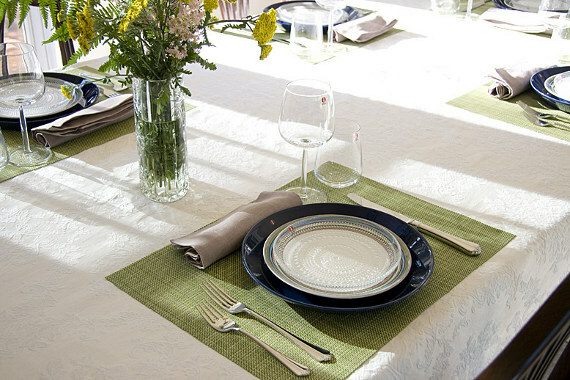 Didriks writes their own blog about entertaining call the dinner series; you can check out this blog for excellent tips on entertaining dinner guests, hosting dinner parties, and great recipes to wow your dinner guests with. Last summer, the dinner series featured a blog post about the perfect June dinner. The table at this perfect June dinner featured a variety of beautiful tableware by Didriks. Check out a photo of the table set here. At this June dinner party, the table was set with Chilewich Placemats, Polylin Blend Napkins by Libeco Home Belgian Linen, Kastehelmi Dewdrop Plates by iittala, and Origo Dinnerware by iittala. This perfect June dinner featured a meal of grilled chicken breast with rosemary, thyme, and oregano, asparagus-new potato hash, a romaine salad with goat cheese, fresh strawberries, blackberries, blueberries, and pecans baked with maple syrup with a balsamic vinaigrette for the salad dressing, and summer fruit jellies. To view the recipes used for this meal, click here.